BeautyCraft, a beauty product recipe book app for iPhone and iPod touch, is now available exclusively on the App Store. 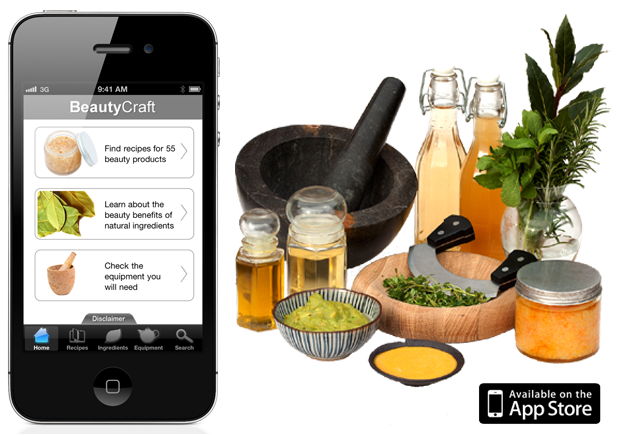 The app teaches you how to make simple and effective, fresh beauty products from natural ingredients that you can source from local stores, using tools you already have in your kitchen! If you're fed up with buying personal care products full of harmful, cancer causing chemicals you can't identify or pronounce, your not alone! Here's where a genius app like this comes in handy. BeautyCraft contains dozens of recipes ranging from face masks to foot scrubs to bath soaks. None of these recipes contain any of the synthetic skin irritants found in most commercial cosmetics. Each recipe is simple to follow and uses only natural ingredients. With over 70 fresh recipes, you're sure to find something you love. So no excuses, get in the kitchen and try some new, natural recipes out! What a fab idea,I am always looking for ways to make products, and having all natural products is sooo important! Nice app it seems. Need to try this once. Especially I am interested in Recipes which helps to make me beautiful. Thanks for sharing it Neccia. No doubt there will number of branded and good cosmetics in the future but there is no any comparison with natural products and nature. Still we have good results and health just because of accepting natural things in our life style. I believe in nature and love it so much. what an amazing app for creating effective beauty products from natural ingredients.Just downloaded it on my iphone.Thnaks for sharing this!